If you’ve never been to Detroit and only know what you see in the news, a story about the city’s future could seem confusing. Change is brewing in the Motor City. New projects are targeting investment in hotspots like downtown and Midtown, and the city’s neighborhoods could see major transformations under long-term plans like Detroit Future City. This century-old warehouse along the Detroit River is one of the last remaining buildings of a major shipbuilding complex that helped develop maritime trade on the Great Lakes. Rather than knock it all down, the Michigan Department of Natural Resources is saving half the warehouse. The new Discovery Center will offer visitors an archery range, 60-foot climbing wall, water sports simulator rides and classrooms to teach kids about Michigan’s wetlands and natural resources. The project is being developed by the Roxbury Group for a total cost of $12.8 million. Straddling Midtown and New Center, business incubator TechTown plans to expand its reach to encompass a 149-acre campus north of Wayne State University. The plan is being put together with the help of Midtown Inc., landscape architecture and urban design firm Sasaki Associates and U3 Ventures. The TechTown building is already being transformed into a collaborative space with a communal kitchen and areas to host pop-ups, and Sasaki’s winning neighborhood revitalization plan includes a central outdoor plaza that will host moveable, adaptable workstations, fabrication labs and fire pits. A cafe, projection screen and climbing wall would attract visitors in the summer, while curling lanes and campfires would keep the plaza active when snow falls. Despite ongoing legal and political roadblocks thrown up by billionaire Ambassador Bridge owner Matty Moroun, the governments of Canada and Michigan plan to build a second international bridge connecting Detroit and Windsor within the next seven years to enhance their $70 billion-a-year trade relationship. The cost to build Michigan’s half of the $950 million span will be repaid through tolls collected on the Canadian side. The last phases of the Woodward Gardens renovation in Midtown are almost complete. Earlier renovations of the Blue Moon Building brought the Great Lakes Coffee bar and offices for Midtown, Inc. Other developments include the new Garden Theatre, with a 1,300 seat capacity, 61 units of market-rate apartment housing at the Woodward Garden Apartments and a 302-space parking garage. 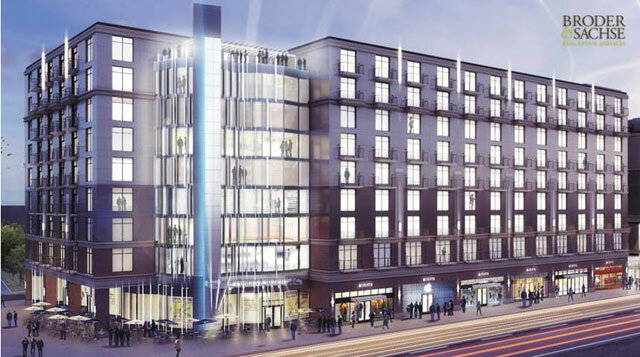 When the $82-million renovation of the David Whitney Building at Woodward Avenue and Grand Circus Park is completed in July 2014, the 19-story building will house the city’s first boutique hotel, Aloft, along with restaurants, apartments and a connection to the People Mover. The 1915 building, named for local lumber baron David Whitney Jr., has been empty since 2000. After more than a year of contentious debate on Detroit’s city council, Emergency Manager Kevyn Orr and Governor Rick Snyder inked a deal to lease Belle Isle, the city’s island park, to the state of Michigan for $1. The move is expected to save Detroit as much as $6 million in maintenance annually. The state’s Department of Natural Resources says it will apply for tens of million dollars in grants to upgrade facilities and infrastructure around the aging park. The iconic downtown Hudson’s department store was reduced to rubble 15 years ago. While no concrete plans have been announced, New York City’s SHoP and Detroit’s Hamilton Anderson Associates will collaborate on a design to finally replace the building, Rock Ventures announced Monday. This summer, the real estate company held a juried competition to redesign the still-empty space on Woodward Ave. The winner of the public vote was “Hudson’s Quarter,” designed by Emilie M. Rottman and James G. Ramil of Washington, D.C. The design’s exterior includes an image of the original department store façade. The development would host retail, a gym, apartments and condos, a performance space and an outdoor arts and music alley. While it’s just an idea, this kind of mixed-use development could anchor the area between Campus Martius and Grand Circus Park, and bring life back to one of Detroit’s most memorable historic sites. After the park itself was completely redone in 2009, a full-scale revitalization of several of the neighborhood’s major historic buildings is on the way. The Capitol Park, Farwell, Griswold, United Way and David Stott buildings are all poised to become new apartments and offices, many with first-floor retail. Schostak Bros & Co., which renovated the Lofts at Merchants Row downtown, plans to build the first new major office building in Detroit since 2005. The 16-story office building at Monroe Block, costing $111 million, will include first-floor retail and a parking deck. This greenway extension will lengthen Detroit’s popular Dequindre Cut greenway, linking it to the Midtown Loop greenway and a trail in neighboring Hamtramck; plus fix deteriorating bridges and improve street appearances in Eastern Market. The project construction has already started, thanks in part to a $10 million federal grant. After a false start in 2011, Detroit’s planned downtown streetcar line is cruising toward new construction. The 3.3 mile rail line is supposed to be only the first phase of a system that will eventually connect Detroit to northern suburbs like Ferndale, Royal Oak and Pontiac along Woodward Ave. Construction is expected to start soon. Coming to the Detroit River: 500 residential units and retail space, thanks to a $55 million development proposed by McCormack Baron Salazar Development Inc. of St. Louis. The first phase will add 300,000 square feet of new construction to Detroit’s East Riverfront. The company is also expected to break ground on another $20 million mixed-use development at John R Street and Palmer Avenue in Midtown. The long-term vision for this historic plaza, as envisioned by Rock Ventures, includes transforming the area into a Market Square with food kiosks, an outdoor bar and a permanent market hall. The square would be lined with cafes and outdoor dining spaces, and Detroit’s historic Four Civic Virtues sculptures would be restored to all their original glory. Village Green bought the former Millender Center Apartments in April and is set to finish full renovations of the building (located directly across from the Renaissance Center) in the summer of next year. The newly renamed Renaissance City Apartments are getting interior makeovers, as is the outdoor Sky Park, which will provide a movie wall, fire pit and grilling stations to residents. What will Detroit look like in 50 years? After thousands of conversations, in January a team appointed by Mayor Dave Bing unveiled the city’s framework for change, recovery and innovation. While it’s not a master plan, Detroit Future City is intended to be a collective resource that will influence the city’s evolution and development. Under its rubric, empty land becomes fertile ground for urban farms. The city leads in green and blue infrastructure, improving connectivity through land and water resources. Neighborhoods reclaim their identities and forge new success. This is a vision for Detroit in 2063 — will it become reality? Ex-warehouses and factories like the Packard Plant could be transformed into live/work industrial spaces for entrepreneurs and makers. Think entire hackerspace neighborhoods zoned for artisans and creatives to live where they create. Detroit’s thriving pockets are islands amid huge swaths of vacant land. The city could repurpose this land into green neighborhoods. Currently blighted neighborhoods would become homes to carbon forests, blue infrastructure projects and urban farms and markets — allowing residents to possibly live, work and find healthy food without leaving their blocks. Closer to downtown, green mixed-use neighborhoods (with Lafayette Park serving as an example) would be connected to the city center via new greenways. Not every neighborhood in future Detroit will be home to an urban farm or tech startup. The city’s currently more populated neighborhoods will be renewed, not bulldozed. Schools will become neighborhood hubs, offering community learning centers, recreation and meeting areas. City services will be improved — meaning more code enforcement against graffiti, derelict landlords and litter, working streetlights and reliable bus service. These new neighborhoods will also have start-up retail opportunities for entrepreneurs. The most important priority will be increasing safety and police response times. Schools in the future Detroit could look a lot like the Detroit School of Arts. Midtown has arguably become Detroit’s most successful — and talked about — district for new commercial and real estate ventures. Mixed-use projects like The Auburn apartments and Willys Overland Lofts are filling their ground floors with new retail ventures, and new construction is ramping up at sites like the former Stone Pool Park, slated to become an apartment complex. In Detroit’s downtown, hotels like the Milner and residential buildings are getting major upgrades. Meanwhile, Quicken Loans honcho Dan Gilbert seems as eager as ever to pick up, develop and promote commerce at properties in the suddenly resurgent city core. Austin Black, President of the City Living Detroit real estate brokerage, told The Huffington Post that residential demand in downtown and Midtown has increased steadily over the last three years. He calls the opening of the Whole Foods grocery store in Midtown, in particular, “a game changer” that has encouraged people to start businesses and relocate downtown. An emerging consequence of this development, however, seems to be the displacement of long-time residents. In both downtown and the Midtown area, building owners have made headlines recently for handing out eviction notices to tenants after reassessing the value of their properties. Investment is also taking place in Detroit’s New Center district. Henry Ford Health Systems is currently pursuing a $500 million mixed-use project on the edge of Midtown and Shelborne Development is rehabbing apartments all over the district. Plans for M-1 Rail and a rumored new entertainment district hint that this momentum isn’t going away anytime soon. Explore 28 notable development projects happening in the D right now. The year is 2025. Detroit, the poster child of the Great Recession, is emerging as a model of urban life. The transformation could be called a miracle but for the fact that the change was wrought by the very things that first made Detroit great: innovation, industriousness, and a will to win against all odds. The metamorphosis grew from desperation. In 2008, two of the Big Three carmakers were swirling toward the sinkhole of bankruptcy. The city’s population, which peaked at 1.85 million during the post—World War II auto boom, was approaching 700,000. Tracts of wilderness, abandoned factories, and empty houses sparked a perverse fascination with Detroit’s ruins. “This whole area really bottomed out,” William Clay “Bill” Ford Jr., Ford’s chairman and a great-grandson of the automotive company’s founder, says. That was Bill Ford’s epiphany; other Detroiters had their own. People with foresight and guts began investing in the city again. Detroit natives who had fled their broken hometown trickled back, joined by pioneering young people who saw past the city’s blight. Instead, they saw available buildings, cheap rents, and a welcome mat for innovators. They saw an iron work ethic and fierce energy. And in a landscape ravaged by depopulation and decay, some bright people saw a blank canvas on which to paint a new urban model. Artists rendering of the Milliken State Park Interpretive Center to be located in the historic Globe Building on Detroit’s east riverfront. / Detroit Economic Development Corp. The Michigan Department of Natural Resources said this morning it anticipates as many as a million visitors a year coming to its planned discovery center to be built in the historic Globe Building on Detroit’s east riverfront. The details were revealed at this morning’s meeting of the city’s Economic Development Corp., a quasi-public board that holds title to the Globe building for the city. Built in stages from the late 19th Century, the Globe was one of the city’s most important industrial buildings in the pre-automotive era. A young Henry Ford worked there before starting his car company, and the building, which served as a dry dock, is a link to the city’s past as a center of shipping. It has been mostly vacant for decades. Under a deal approved this morning, the EDC will sell the building to local developer Roxbury Group for a dollar. Roxbury will then develop it to DNR’s specs with the help of a $11 million financing from the state’s Natural Resources Trust Fund. DNR will eventually purchase the building when it’s ready in fall 2013 for a total project cost of $12.8 million. About half of the historic building will come down, with the rest preserved and renovated for the DNR space, which is adjacent to the William Milliken State Park, as well as the Detroit RiverWalk. “We envision that we could easily on the low side see a million visitors every year,” Vicki Anthes, chief of the DNR’s planning section, told the EDC board this morning. The DNR had initially planned a much smaller space inside the Globe Building, but scaled up the plans to about 50,000 square feet of “outdoor adventure” exhibits, activities, and classrooms, as well as office space for about 20 DNR staffers now based in Southfield.